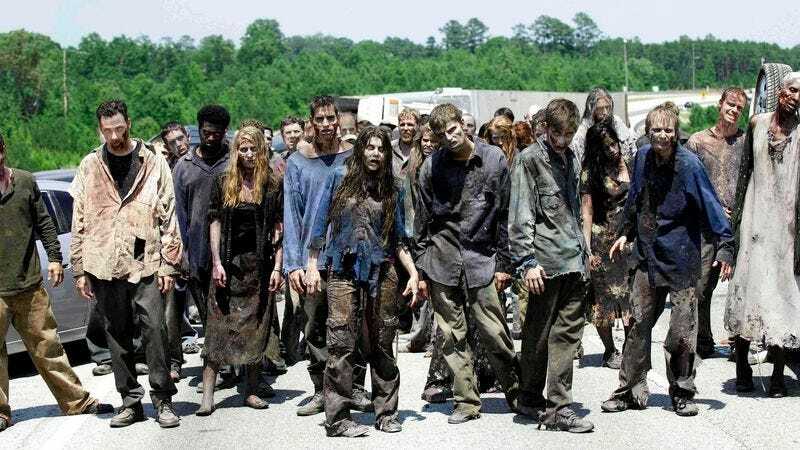 Recognizing that there’s only so much of the world of a zombie apocalypse that can be explored in between circular arguments about trust, AMC is developing a spinoff of The Walking Dead to air in 2015, the network announced today. Characterized as a “companion series,” the new, as-yet-untitled show from executive producers Robert Kirkman, Gale Ann Hurd, and David Alpert will take place in the same universe, telling original stories that Kirkman says won’t be “tethered by the events of the comic book,” much like The Walking Dead. And much like new companions on that show, it will be greeted with suspicion, and the fear that it will just be a drain on already-overtaxed resources. Still, the network is confident that there’s room for more than one ragtag group of survivors in this crazy, mixed-up, zombie world: “Building on the success of the most popular show on television for adults 18-49 is literally a no-brainer,” said AMC president of zombie puns Charlie Collier. “It’s a big world and we can’t wait to give fans another unforgettable view of the zombie apocalypse.” For example, maybe this time it’s from the zombies’ point of view, as their new, freewheelin’ zombie lives are repeatedly impinged upon by the stupid chatty humans they’re forced to eat just to shut them up.